Hello Readers! Here’s the latest newsletter I sent out. If you’d like to receive it, just sign up on my contact me page. To view the newsletter outside of this blog, use this link. This fall I returned to teaching at Simmons University after being on leave during the 2017/2018 academic year. I’m teaching three graduate classes: The Child and the Book and The Picturebook on the main campus in Boston, and Criticism of Children’s Literature in our satellite program at The Eric Carle Museum of Picture Book Art. It’s wonderful to be back in the classroom with some truly amazing, dedicated, talented students, but if you’ve read or listened to my #KidLitWomen post “Of Kitchen Tables, Stovetops, and Scales”, you’ll understand what I mean when I say that my “work burner” is on HIGH right now. I recently joked that I added something to my to-do list after I completed it just so that I could cross it off, and…yeah…that about sums things up! I’m now crossing “newsletter” off that list because ‘tis the season to remind readers that signed copies of my books are available through The Carle’s Shop, including Real Sisters Pretend, which was just named a “Picture Book/Early Reader Must Read” by the 17th Annual Massachusetts Book Awards. Would you like personalized signings for this book, A Crow of His Own, or Reading Picture Books with Children? Just contact The Carle’s Shop to tell them what you’d like me to write, and I’ll add a little message for the kids, teachers, librarians, parents, writers, or other readers in your life…or for you! 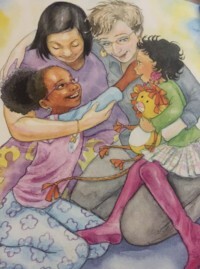 And, if you visit The Carle in person instead of ordering books online, you’ll be able to see a digital reproduction of one of Nicole Tadgell’s beautiful illustrations from Real Sisters Pretend included in the Reading Library exhibition, “All: A Look into LGBTQ Representation in Picture Books.” You’ll also be able to fill your heart up to overflowing when you view the gallery exhibition, “Our Voice: Celebrating the Coretta Scott King Illustrator Awards.” I brought my Simmons Picturebook course to the opening reception, where we had the amazing experience of hearing artists Jerry Pinkney, Ekua Holmes, and Gordon C. James in conversation. If you’ve never been to The Carle, now is the time to visit. This exhibition is not to be missed. Do you and yours already have copies aplenty of my books? First—THANK you! Second—maybe you’d like to instead purchase a subscription to OurShelves? I’m on the Curation Team for this quarterly book box subscription service, which just launched. Sign up to begin receiving (or gifting) diverse picture books and board books, including many with LGBTQ+ content. There are three levels of subscriptions for children ages 0-2, 2-5, and 5-7, and the first boxes will ship in early December. I’m so excited about this new effort and am hopeful that it will help demonstrate the great need and demand for inclusive, diverse children’s literature. But! This newsletter isn’t all about promoting my own books and bookish projects. Returning to my #KidLitWomen essay analogy, I now want to turn up the “family burner” on my stovetop to tell you about some amazing things that people in my extended family are creating in case you’d like to bring some of their art into your lives. 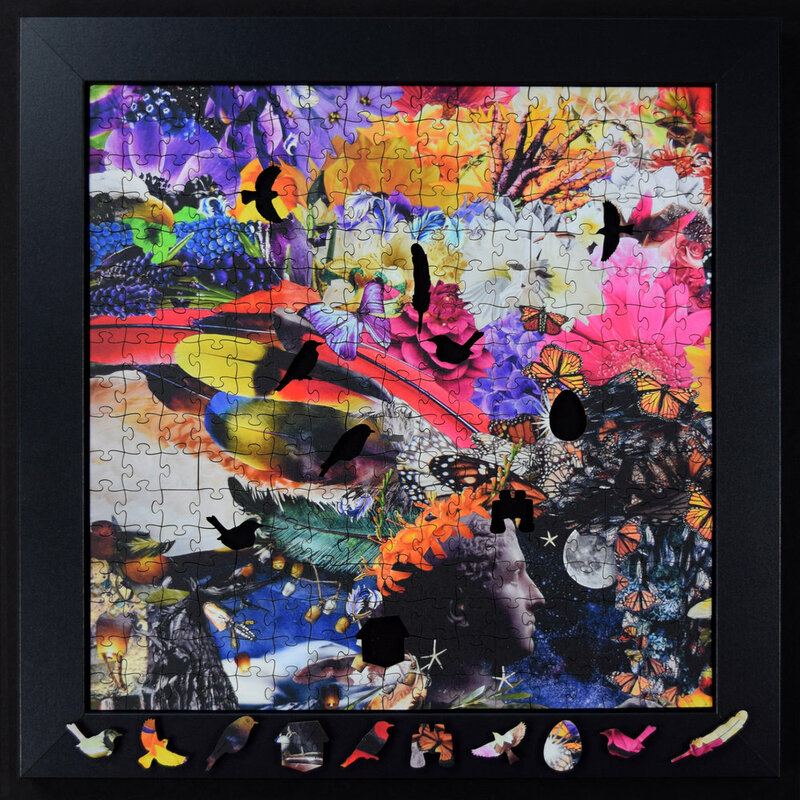 First, my sister, Keita Grace Lambert, has just launched a website, MothershipPuzzle.com, to sell gorgeous wooden puzzles, magnets, and stickers based on her massive collage called “The Mothership.” The photo to the right is just one of 15 puzzles that make up the whole artwork, and I adore the special “whimsy” pieces with their fanciful shapes. Keita describes her work as “A visual instrument encouraging us to find & create stillness within chaos.” Sounds good to me! 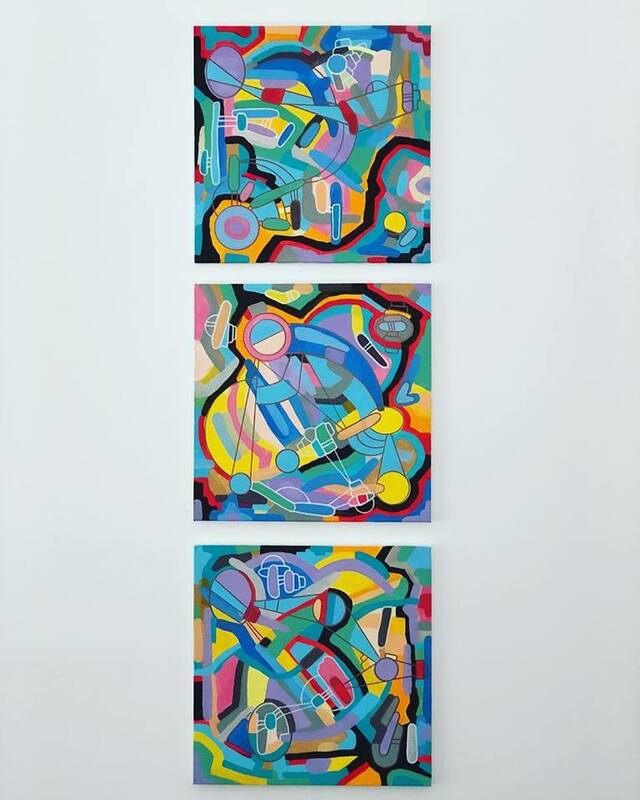 My brother, artist Sean Paul Lambert, who painted the abstract triptych included here, refuses to create a website of his own, despite my best, bossy-big-sister advice that he really shoulddo so. But, he seems to be doing just fine without one: he was one of the winners of the Nike Biketown PDX Design Challenge last May, and collectors and galleries where he lives in Portland, Oregon are taking notice of his work. You can check out his art on Instagram and Facebook (https://www.facebook.com/Lambskins) where he also sells pieces and takes commissions. In my Dowd family , my cousin, Hannah Ellingwood, is also a gifted artist. 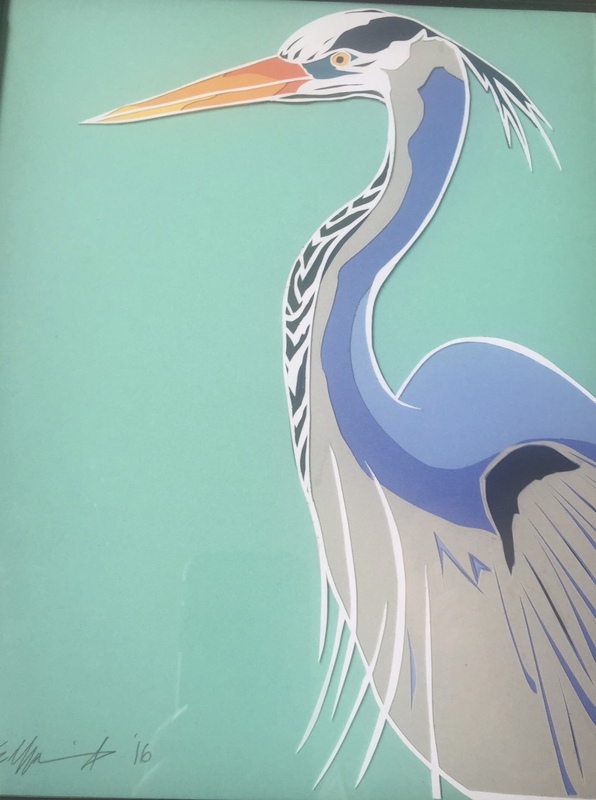 I treasure the blue heron collage that my husband commissioned her to make as a birthday gift for me a few years ago. 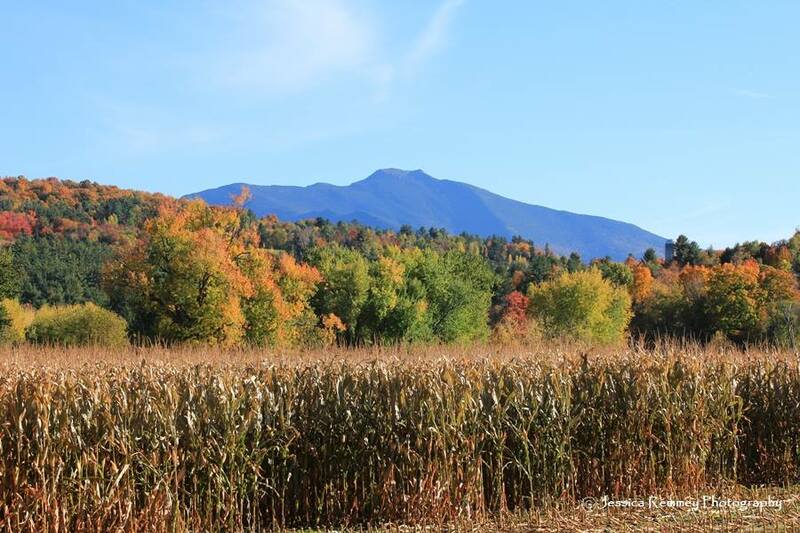 And, in my Lambert family, my cousin, Jessica Remmey, is a photographer who creates gorgeous calendars, prints, and stationery inspired by the northwestern Vermont landscape where nine generations of our family have lived. Take a peek at her Facebook page for gift ideas, or track her down at one of the many craft fairs she attends. And, if you have a crime fiction reader in your life, put my cousin-in-law, author Theresa Schwegel’s, books on your gift list, too. The other burner s in my stovetop analogy for life in the #KidLitWomen post are for my own health and for friendships, and I admit they’re on pretty low heats right now. But as Thanksgiving approaches, I’m truly grateful for my good (if rather neglected!) health and for the friends who are there for me, even if we don’t get to see each other much right now. I don’t take either for granted. 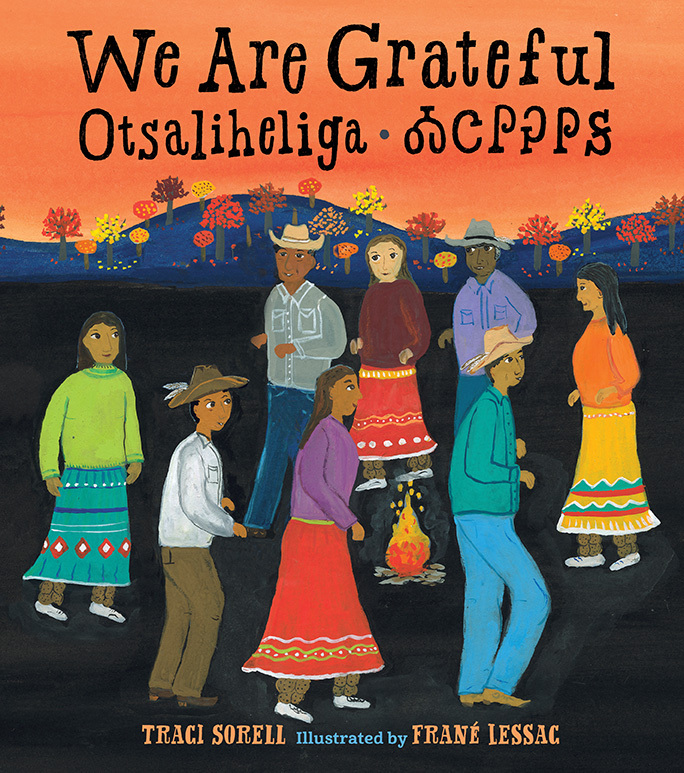 Here’s a new picture book from my publisher, Charlesbridge, that I’ve thought of many times as I’ve reflected on the sincere sense of gratitude I try to hold onto even when the pots on my stovetop boil over–or perhaps especially then: We Are Grateful: Otsaliheliga by Traci Sorell, illustrated by Frané Lessac. The cultural context of this book about contemporary life in the Cherokee nation is different from my own, but its depictions of gratitude throughout the seasons and in various contexts feels universal. Finally, please let me know if you’re interested in bringing me to your classroom or library to talk about my work or lead storytimes in the new year. I’ve also been doing more Skype visits lately, which are pretty easy to schedule since I can do them from home, but nothing beats the chance to return to a real storytime rug. I’m also always grateful to see former students going on to achieve great things. 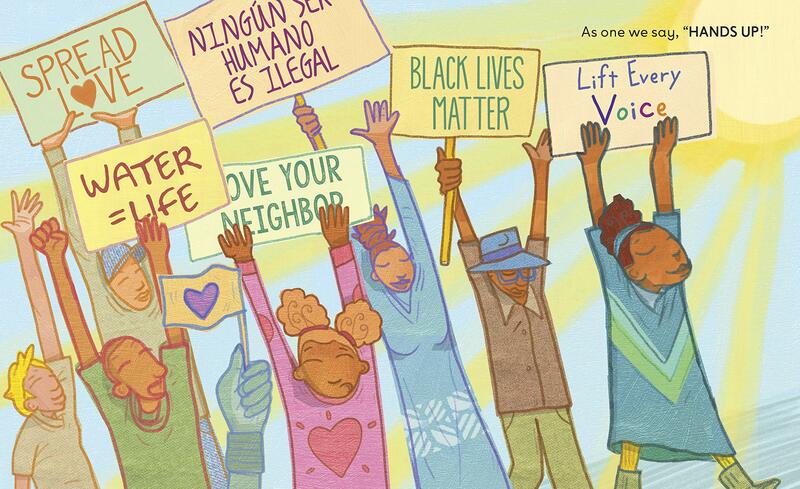 The illustration above is from Breanna J. McDaniel’s forthcoming picture book, Hands Up!, illustrated by Shane Evans, which received a starred review in Publisher’s Weekly. You can preorder it here. Want to see what other Simmons grads have been writing? Check out my recent Twitter thread for #NationalAuthorsDay, and if I’ve missed your book, let me know!